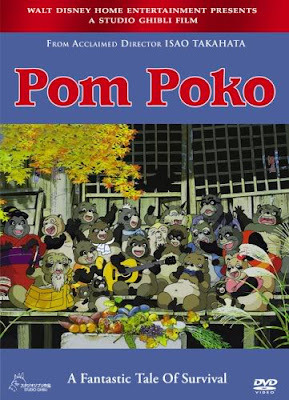 I was reading my sister Kate's comments about animals-that-talk and thought I'll add another entry to the genre, Studio Ghibli's Pom Poko. It's easily their oddest film--to western eyes, at least--about a bunch of racoons trying to keep their land from being turned into a giant Tokyo subdivision. The movie takes place during the construction of Tama New Town, a real place. What makes it unique and rather disconcerting to anybody used to the typical Disney fare is that first, the story is told in the context of Japanese fairy tales that never went through the Victorian Bowdlerizing machine (a good review of tanuki folklore here). And second, we're not talking about the popular, western concept of "environmentalism." In Japanese folk tales, the tanuki, or raccoon (slightly different but close enough), and the fox are depicted as tricksters and, more importantly, shape-shifters who can pretend to be human. The difference between the two is that if the fox is Dean Martin (cool), the raccoon is Jerry Lewis (comic relief). So this bunch of raccoons has considerable trouble getting their act together. And when they do, it's not pretty. We're talking original Grimm-type material. Pom Poko is way more Terry Gilliam than Uncle Walt. The raccoon's shape-shifting can takes many forms, and includes the ability to do rather amazing things with their, ahem, testicles. The English dub manages to be more discreet than the sub, but I would bet that no official Disney kid's flick has ever before broached the subject. The raccoons and humans end up killing a lot of each other, as in dead, and not the heartrending Bambi stuff. In other words, when anvils get dropped, heads get squashed (though squashed off screen). For the raccoons, it ends up being one pyrrhic victory after another. After all, Tama New Town ended up being built, so the outcome is pretty much predetermined. What makes it far more than just another Road Runner & Wile E. Coyote cartoon is the very clever things the film has to say about how activists react differently to a cause, concluding with the futility of taking militant measures against a superior force. As my sister says about the Ewoks in Return of the Jedi, "Yeah, sure, Winne the Pooh versus lasers. My vote is on the lasers." It also points out the essential hypocrisy of high-minded environmentalism. There's a hilarious scene where the tanuki get distracted talking about all the great human stuff they can't imagine doing without (recall the "What did the Romans ever do for us?" scene from Life of Brian). In the U.S., I think especially the left-wing of environmentalism is actually a mutated kind of Christian fundamentalism (the extremes of any movement eventually meet). Eden is recast as "wilderness," the perfect, people-less landscape before the Fall (or at least before 1492). In a country like Japan, there is no people-less wilderness, only places where lots of people don't happen to live right now (let's not even bring up the subject of whaling). The question was not whether Tama New Town would be built, but what kind of place it would turn out to be. And the movie's surprising answer is that--thanks to the raccoons--it turned out about as well as could be expected.